This page is focused on your rose garden. However it may be helpful to check out these general gardening tips as well. If you are like many gardeners you will quite possibly want some to plant some roses. They are lovely plants and your rose garden can be a delightful place. There are many, many options for this part of your garden. First, let's distinguish between planting dormant roses and those that have been nursery grown pots or containers. Roses which are dormant and bare roots grow well but usually don't bloom as soon as those in the containers or pots. The ones in containers and pots have already started their growing cycle. If you are buying dormant plants it is important to make sure that they are g #1 grade. These will grow faster as they are healthier and will give you a much better crop of flowers during the summer in your rose garden. Pick an area that will get at least 5-6 hours of sunlight a day. Sun is a very important part of the growth cycle of your rose garden. The soil should be a good loam and can be mixed with some clay. The loam should be down to a depth of at least 12-15 inches. Dig the soil out for the plant so that it will fit the plant with no damage to the roots and that the first bud spike will set about an inch below the surface. It is also good to loosen the dirt at the bottom of the hole. Before setting the plant into the hole in the rose garden, a little mature manure is good to mix into the loosened dirt at the bottom of the hole. Trim any damaged roots and then set the plant into the hole. Be sure that the loam you put put around the plant is loose as well. Fill the hole to about 2/3 - 3/4 and tap it down. Water the plant and the dirt. Let the water settle then add the rest of the loam. Tap it down again. For dormant plants mound the soil over the plant so it will not dry out. For plants that were in pots or containers there is no need to mound the soil. It should be planted like you would any other plant. It is good to add a few inches of mulch around the plant base as this contains the moisture. 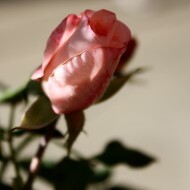 Roses should be watered about every 7 - 10 days and you need to water the base of the plant. If you water the flower and the leaves it is easier for the plant to get diseases like mildew or black rot which can infect it the leaves and the flower and be a problem. Although discussion of roses and rose planting is a diversion diversion from orchids it is definitely in line with my personal interests and I find those of many of my subscribers as well. I adore plants of many kinds, even though this website is essentially devoted to orchids. Planting can take place between mid October and mid May. In general, you should not plant or transplant after mid May until October. Of course, if you have to move your rose(s) they are fairly resilient and will generally respond well at any time. It is just better to follow the guidelines above. This page on Orchids Plus More just barely touches on roses. If you are really interested in learning care of roses then check out this great site that ONLY focuses on roses and everything related to growing roses and having a rose garden. Good luck and happy growing in your rose garden.